These six game-improvement irons can help your game blast off in 2017. If game-improvement irons are the clubs for you, here are six options you can put in your bag in 2017. Engineered for mid- to high-handicappers, the 1020-carbon steel heads have a tapered bar behind the sweet spot that contributes to the club's low center of gravity and higher-launching shots. Similar to the J15 CB in feel and topline appearance, the JGR CB Forged is more forgiving, thanks to a longer face with 4 percent more hitting area, a wider sole with a beveled leading edge (to limit digging), and more offset. The seven-piece set (5-iron to AW) comes with True Temper XP 95 steel or UST Mamiya Recoil (660, 670 and 680) graphite shafts. The company's top-selling irons just got a facelift. TaylorMade has racheted up the speed and power on misses with face slots in the 3- to 8-irons (to help heel and toe hits) and a thinner, more flexible speed pocket in the 3- to 7-irons (for thin shots). An updated fluted hosel frees up two more grams, which get placed low in the head to boost launch. The M2 also has a new damping system—additional adhesive in the cavity combines with two bars that support specific areas of the face—for a more pleasing sound and feel. Plus, a hosel notch makes the M2 easy to bend for lie angle. In stores January 27. These babies are built for guys who want a compact, powerful head with more maneuverability than the M2. Like its larger sibling, the M1 features face slots (3-8) and a speed pocket (3-7) to increase ball speed on misses. A 15-gram tungsten weight in the toe moves the club's CG lower and more toward the center, so solid strikes are rewarded with precise results. Only one half of the hosel is fluted, which saves weight while maintaining a traditional look at address. Plus, bars in the back of the head and ribs near the topline enhance sound and feel. In stores March 1. The priciest irons of the bunch, XXIO's ritzy Prime line extends the company's "Dual Speed" technology—heavier-than-standard head with a lighter, high-balance-point shaft—to help slower swingers create lag during the downswing for added oomph at impact. The 5- to 7-irons have a tungsten-nickel soleplate plus interior tungsten-nickel weights. Packing all that mass down low stabilizes the head and drops the CG lower and deeper for higher-launching shots. Plus, the titanium face insert extends closer to the turf for more ball speed on thin hits. And much like the XXIO9 model, the 8- and 9-irons ditch the internal weighting but retain the soleplate; the matching PW and SW are all-stainless steel. Low- and mid-handicappers, rejoice! These forged cavity backs get in and out of the turf with ease. Their secret: A V-shaped sole with more bounce than the Prime, which reduces digging and improves consistency for players with a steep angle of attack. The carbon steel heads have a high-strength steel face that's thinned out in the low toe and heel to increase ball speed on mis-hits. Both lightweight shafts—the Nippon N.S. Pro 930GH DST steel and the XXIO MX-6000 graphite—have a firm tip section to limit dispersion and a softer section near the grip for a more powerful release. 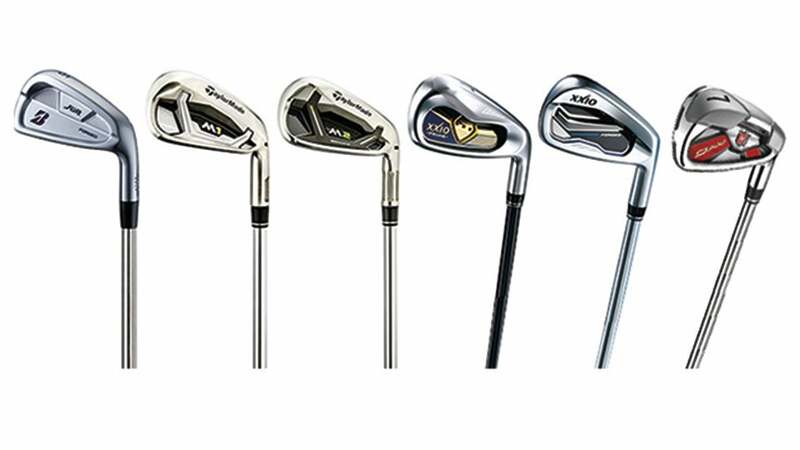 These powerful max game-improvement irons pick up where last year's C200 irons left off. Updating 'FLX Face' technology (the wall thicknesses have changed as well as the spacing and length for the "power holes") bolstered its effectiveness in the larger, more forgiving head. Again, the "power holes" around the entire head create space for the clubface to flex more at impact and generate faster ball speed. The holes also free up mass that's repositioned low and back (there are weight pods in the heel and toe) to increase perimeter weighting for added head stability. The holes get filled with a urethane material, which controls vibration and is malleable so the face can flex easily. Available in KBS Tour 80 steel shafts or Matrix Speed Rulz A-type 54 graphite shafts.